It's that time again, music-lovers! 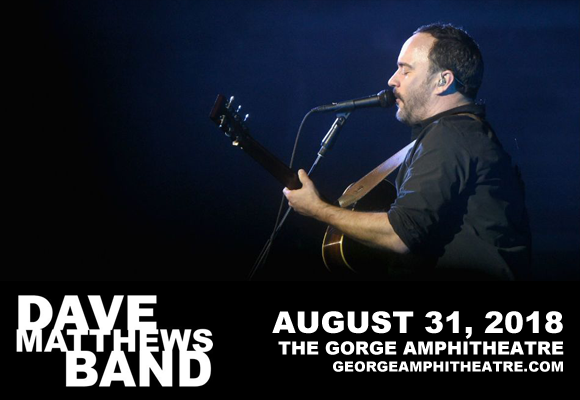 Labor Day weekend can only mean one thing at The Gorge – Dave Matthews Band is coming!!! Once again, Dave and his crew of phenomenal musicians come to Gorge Amphitheatre for three days of amazing vibes and non-stop tunes! Starting on Friday 31st August 2018, the DMB-fest will be a little different this year as the band will not only be performing fan favorites, but also some fresh new tracks from their upcoming ninth studio album! Tickets available now! Dave Matthews Band is an American rock group that was formed in Charlottesville, Virginia in 1991. Originally a college band, throughout the years DMB built up a dedicated following due to their energetic and improvisational live performances. Under the Table and Dreaming, the band's debut studio album, was released in 1994 to great acclaim and by 1997, the band had received four Grammy Award nominations. However, despite their commercial success, the group remained dedicated to touring, and continue to embark upon annual summer-long tours across North America. The Gorge Amphitheatre is a staple of the DMB annual summer tour, and the band has performed at the venue over fifty times.